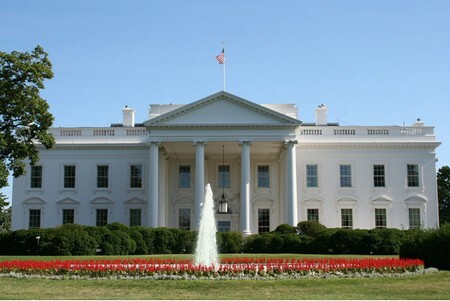 The White House is the official residence and chief workplace of the President of the United States. Situated in Washington DC, its architectural designed was delineated by Irish-born James Hoban and finally built between 1792 and 1800 with Aquia sandstone painted white on Georgian style. Since John Adams, it has been the workplace of every U.S. President. In 1801, when Thomas Jefferson shifted into the house, he sought services of the architect Benjamin Henry Latrobe to expand the building to the exterior, ushering into two colonnades that were supposed to hide stables and storage. During the War of 1812, as part of the Burning of Washington, the British Army set the mansion on fire, damaging the interior and burning a great part of the exterior. Without any delay reconstruction was commissioned, and the President, James Monroe moved into the scantly reconstructed building by October 1817. This time construction included the addition of the South Portico in 1824 and the North in 1829. In 1901, President Theodore Roosevelt had to relocate nearly all work offices to the newly constructed West Wing because of congestion within the executive mansion. After eight years, President William Howard Taft extended the West Wing and erected the first Oval Office which was moved too later on with the expansion of the section. In 1927, the third-floor attic was transformed into living quarters by enhancing the existing hip roof with long shed of dorms. The newly constructed East Wing was defined as a reception area during social celebrations; Jefferson’s arcades joined the new wings. To make room for additional office space, some alterations were made in the East Wing in 1946. By 1948, the house’s main supporting exterior walls and internal wooden beams were found to be close to decaying. When Harry S. Truman took over, the rooms were progressively substituted by new internal strong steel frame constructed toward the interior. After the completion of interior frame work came the turn of the interior rooms. The White House Complex, today, includes the West Wing, Executive Residence, Cabinet Room, Roosevelt Room, East Wing, and the Old Executive Office Building, which accommodates the executive offices for the President and Vice President. Formerly the White House building was referred to differently as the “Presidential Mansion”, “President’s Palace”, or “President’s House”. The building of present day president house was designated “White House” for the first time in 1811. A myth surfaced that over the course of reconstruction white paint was extensively applied to hide the burn scratches it had suffered, giving the building a tinge resembling its name. The title “Executive Mansion” was mostly used in official contexts until President Theodore Roosevelt awarded the formal name by getting “White House–Washington” printed on the stationery in 1901. Finally the current letterhead wording “The White House” with “Washington” centered beneath dates back to the exigency of Franklin Delano Roosevelt.